Since the fall of the Jedi order Baze had lost his way and turned to anger against the Empire. Periods of faithlessness can cycle. Like Jyn’s lack of faith in any cause. It is okay and even natural to go through such times, however it is imperative to act when you are called. Like most of the characters in Rogue One acted when called to action. Baze may have lost his faith until the end, but he did not lose his faith in his friend Chirrut Imwe. On the other side of the coin from Baze is Chirrut. Chirrut is light-hearted and humorous. Chirrut may have been lacking sight, but was not lacking insight. “Your eyes can deceive you, don’t trust them.” What we see of the world depends greatly “on our own point of view”. It is made up of the senses, of our collective past experiences. Trust in yourself, trust in your instincts, trust in the Force. When one sense is removed we naturally depend on another, bringing it into sharper focus. In meditation we strive to let go of all, thereby allowing ourselves to be one with the Force. Should faith be blind? It often is, although such beliefs can easily lead to zealotry and unbending extremes. As with any question, introspective review in contemplative meditation is required. Often it is through stillness and clarity that the answers come to us naturally. Faith in the force, may not be blind since we can literally feel the force. 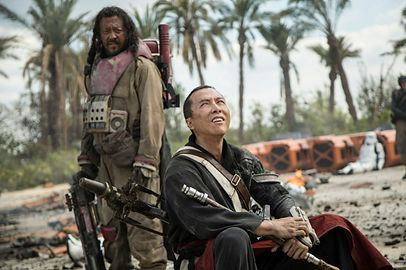 May we all be as blind as Chirrut Imwe.